Celiac / gluten intolerant and want to travel? When you are a celiac / intolerant, life is relatively easy at home. You can manage. You know all the gluten free products of your local stores;-) It gets a bit more difficult when you want to eat outside, at places you don’t know yet. And then it gets much more complicated when you travel…You know you will manage (fruits/vegetables my dear friends…), but you also know that it can become very stressing and time consuming reading in details all the restaurant menus, asking and checking with the waiters, reading all the ingredient lists of all the products at the store, etc…Now imagine you have to go through all that…in Japanese? in Chinese? in Indonesian?! a bit stressing isn’t it? 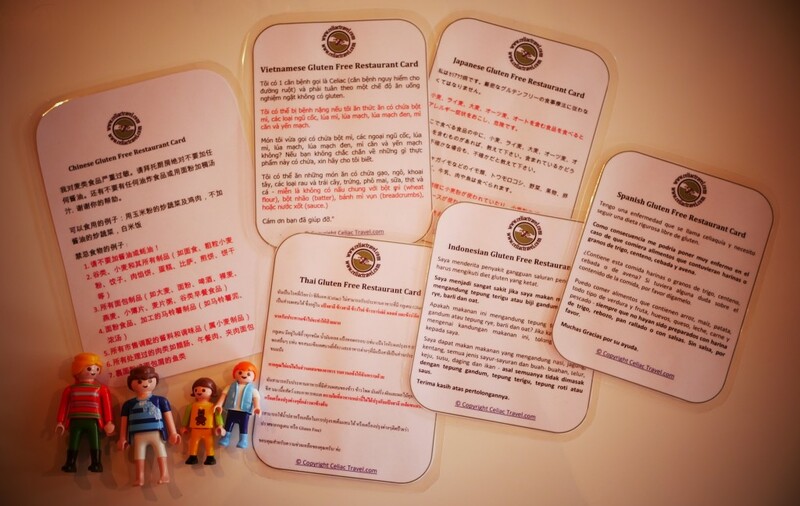 TIP 1: if you don’t want to end eating only fruits, vegetables and bland rice…use translation cards! 😉 You can find several on internet, in many languages. Here are some prepared by Roger and Lyndsay : http://www.celiactravel.com/cards/ (you can make a donation for their work) & you can also prepare them yourself using Google Translate! TIP 2: if you’re planning to travel over a long time period / in many countries, I recommend printing these cards (e.g. half A4 page) and cover them with plastic so that you can transport them in your backpack easily, use them on a daily basis, show them to the cooks/waiters without having to print them again every 3 days!